Key organisations from across the screen industry have made a united and formal commitment to work towards building a more inclusive sector. The Australian Film, Television and Radio School (AFTRS), Foxtel, ABC, SBS, Network Ten, Australian Directors’ Guild (ADG), Screen Producers’ Australia (SPA), FreeTV Australia, ASTRA, the Australian Screen Industry Group, MediaRING, Screen Australia and each of the state screen agencies this week joined together to form the Screen Diversity and Inclusion Network (SDIN). To join the SDIN, all of the organisations have had to officially commit to a charterthat enshrines equal opportunities, regardless of age, gender, sexual orientation, nationality, religion, disability or geographic location. 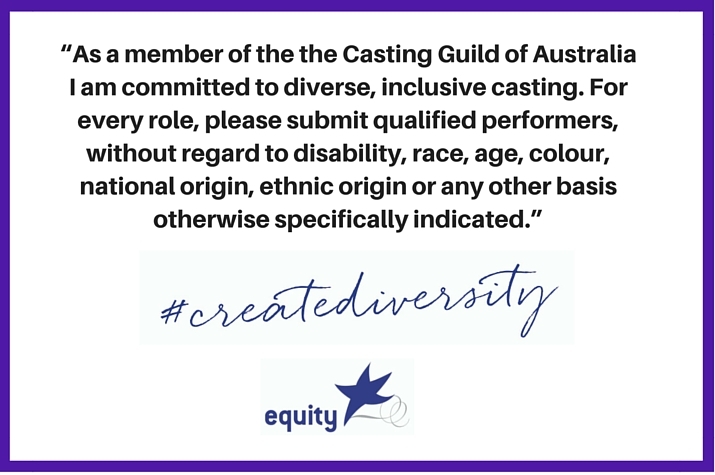 Following extensive consultation with the Equity Diversity Committee, the Casting Guild of Australia (CGA) has adopted a diversity policy that will now be included on their website, Facebook page and in CGA members’ casting briefs and email signatures. Equity Diversity Committee co-chair Bali Padda said by adopting this diversity policy, the Casting Guild of Australia acknowledges the true diversity of our performing arts community and the society we represent on screens and stages. The CGA has notified all members of their new policy. Equity congratulates our Diversity Committee and the CGA’s Executive Committee on this major step forward for our industry. It started with a hashtag, and it’s turned into a juggernaut. The #OscarsSoWhite campaign has put Hollywood in the spotlight. It has led to headlines, talk of boycotts and a plan to change the procedures for Academy membership and Oscar voting. It came from highlighting a simple fact. For the second year, all the nominees in the acting category at the Academy Awards are white. There are nominations for two films with an African-American focus – the Rocky reboot Creed and the rap biopic Straight Outta Compton – but they’ve gone to a white actor (Sylvester Stallone) and white screenwriters. IF you think Australian TV is dominated by white faces, you’re certainly not alone.